Living in ever-precarious times, what are we to make of the future? Artists and technologists have long been the architects of the future, transporting audiences to worlds on the horizon. While imagined futures suggest the virtuousness of newness and connectivity, they also call upon the spectre of the past, warning us of dangers ahead should we not work to transform our present. In the tradition of past Art Intersections meetups, we have invited two interdisciplinary artists who are imagining and imaging futures. Game and narrative designer Sophia Park deconstructs the relationships formed between humans and increasingly-sentient technologies, while filmmaker Cara Mumford re-orients human relationships to the land in exploring the future of Indigenous sovereignty. Moderated by Karl Schroeder, a science-fiction writer and professional futurist, this conversation will bring to light how representations of the future work to alter the present. Art Intersections Meetup is a meeting place for artists, moving image-makers, gamers and technologists who are experimenting with art-related digital content and how the moving image is presented in a connected world. Digital culture, social media and networks encourage new ways of storytelling, image making, idea sharing and collaboration. This Meetup celebrates artists and innovators who are embracing change leading the next wave of creativity. This event is FREE! RSVP here. Sophia Park is a narrative and game designer in Toronto and the founder of Aether Interactive, a game development collective focused on creating interactive works about deconstruction and compassion; exploring the relationships we’re already forming with technology; and challenging the myths of nostalgia. Her second release, Forgotten, was described by Wired Magazine as the “first must-play game of the year” in January 2017. 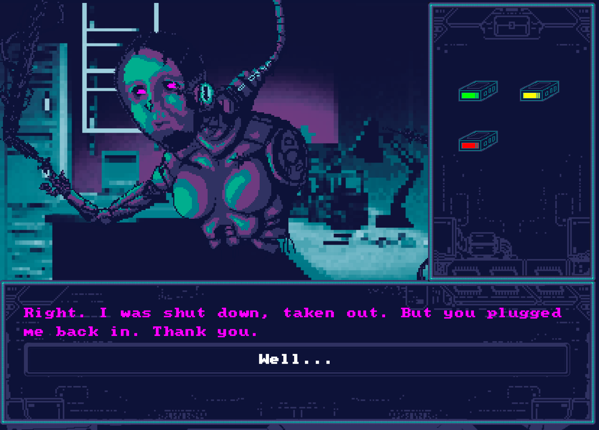 Her latest work with Aether Interactive, LOCALHOST, released in September 2017, is about what happens when your entry-level job is to refurbish hard drives, and convince artificial intelligences to let you delete them so you can repurpose the hard drives they live on. LOCALHOST and her future projects are concerned with the biological imperatives hidden within the artificial, about the intersections between increasingly technological work and increasingly conversational, sentient assistants, and our new relationship with the synthetic. 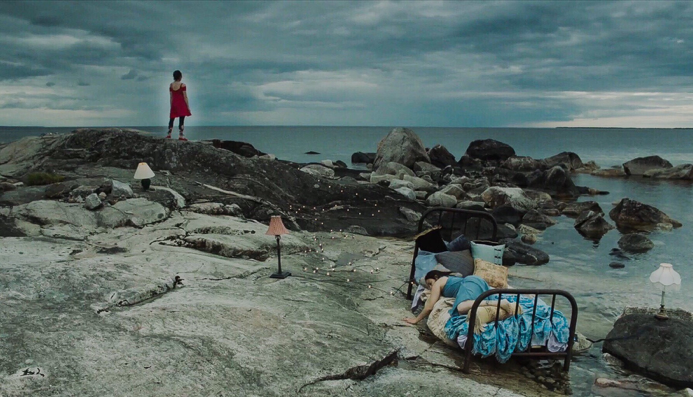 Image: Cara Mumford, Ecstasy, film still, 2012. Credit: Elisa L. Iannacone. Cara Mumford (Métis / Chippewa Cree) is a filmmaker, writer, and collaborative artist from Alberta, living in Peterborough, Ontario since 2010. Since becoming a filmmaker in 2006, Cara’s short films have screened regularly at the imagineNATIVE Film + Media Arts Festival in Toronto, and toured throughout Australia and internationally with the World of Women Film Festival. She has received industry training through Telefilm Canada (2010/11), Bell Media’s Diverse Screenwriters Program (2012), the imagineNATIVE Film Festival’s Story Lab (2014) & Producer Mini-Lab with Heather Rae (2015), and the National Film Board’s Digital Studio (2016/17). Cara’s films tend to focus on the connections between her identity as an Indigenous woman and living in balance with the land, often incorporating elements such as dance, dreams, and futurisms in her storytelling. She believes that the connection we have with the land today determines the future we have tomorrow. Karl Schroeder is an award winning Canadian science fiction author and futurist. He is a member of the Association of Professional Futurists, and has ten published novels translated into as many languages. He writes, gives talks, and conducts workshops on numerous topics related to the future. To watch past presentations by Adrienne Crossman, Thirza Cuthand, Jacob Niedzwieki, Nicole Del Medico, Jeremy Bailey and Midi Onodera please click here. Presented by Akimbo in collaboration with Gamma Space, OCAD U and Charles Street Video. Supported by Beau’s Brewing Company.